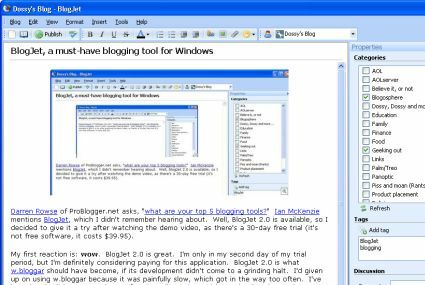 Darren Rowse of ProBlogger.net asks, “what are your top 5 blogging tools?” Ian McKenzie mentions BlogJet, which I didn’t remember hearing about. Well, BlogJet 2.0 is available, so I decided to give it a try after watching the demo video, as there’s a 30-day free trial (it’s not free software, it costs $39.95). My first reaction is: wow. BlogJet 2.0 is great. I’m only in my second day of my trial period, but I’m definitely considering paying for this application. BlogJet 2.0 is what w.bloggar should have become, if its development didn’t come to a grinding halt. I’d given up on using w.bloggar because it was painfully slow, which got in the way too often. I’ve been hand-editing HTML using my favorite editor, vim, and just uploading the entries manually. It wasn’t convenient, but it was fast and predictable, which are more important to me. I have a bunch of macros bound to F-keys to make any repeated task trivial, so it was quite comfortable. However, there’s still a few tasks that I never got around to automating, and that’s a pain point for me. Of course, I wouldn’t be me if I weren’t so damned hypercritical: there are a few warts on BlogJet 2.0 that I don’t know how long I could live with. They’re probably non-issues for your average blogger, but they annoy the hell out of me. Not like you really care, but let me tell you about them. I guess most bloggers don’t use section headers, otherwise how did BlogJet get to 2.0 without implementing this? Luckily, I can Ctrl-Tab into the source view and hand-edit the HTML (thank goodness) but for an application that is so nicely polished, this was surprising. I’m hoping this was just a small oversight and will be added to a follow-up release. This is only a minor inconvenience, and I can definitely live with this. I guess this is just a pet peeve of mine, but I really like my IMG tags to have their height and width attributes specified when I know their values in advance. It would be nice if there were a checkbox in the application’s preferences to tell BlogJet to include those in the generated markup. For now, I’m hand-adding it after publishing a blog entry, but that’s tedious. Dude, where’s my nice markup? I have a general displeasure with the HTML markup that BlogJet generates, but I suspect that has a lot to do with the embedded IE control that it uses for the WYSIWYG HTML editing, but it’d be nice if BlogJet allowed you to specify some simple post-processing filters to programmatically clean up the markup before it’s published. Similar to the usefulness of BlogJet’s “Auto Replace” feature, being able to define a series of regular expression transformations to apply to the generated markup would be a nice touch. Notice anything? Like, the fact that there’s no “query” portion? The “tag” itself is part of the “path” portion of the URL. Therefore, it should be encoded following the rules that govern encoding the “path” portion of the URL. Which means, spaces should be encoded to “%20” instead of “+” and if you did want an actual “+” in your tag text, it would be replaced with “%2B” in the URL. Right now, in BlogJet 2.0.0.9 (the specific version I’m trying out), if I add a tag with spaces in it, the tag link body has the space replaced with a “+” and it’s also in the tag link href the same way. There’s no way for me to create a tag with an actual whitespace in the text. And, since BlogJet treats tags “specially” I can’t even go into the HTML source view and hand correct this. Ugh. Again, I’m hoping this is a simple matter to fix, but this is of course the problem with closed-source software products: I’m entirely at the mercy of the original developer to make the necessary changes. And, it’s the prerogative of that developer to ignore my pleas and not make the changes at all, leaving me with no alternatives other than to not use the product. Snow Leopard: Bring on the pain!